It is very easy to get hung up in the technical and management side of Projects and forget that they need to be delivered by human teams. So "Always remember the human side" is the key phrase I keep as a prompt. In this post I will look at the human side of teams. It isn't an easy subject because as with most things "human" there is no exact science to get to where you ideally want to end up - with a high performing project team. So I accept that while these are my views, some may disagree or have different approaches. We all know a high performing project team when we see one. Everyone contributing, looking out for and supporting colleagues, going the "extra mile" to achieve milestones. Basically producing more than the sum of the parts. But how do we get to this state? 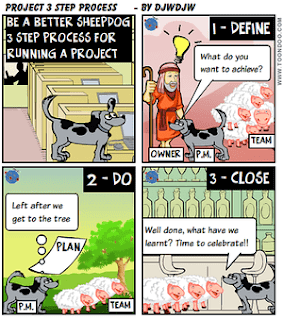 From what I have observed in the IT world at least, project teams are typically brought together for the Project with typically a mixture of in-house resources (including some seconded to the project from other roles) augmented by individual contractors and third party suppliers (who may have a small or large part in the overall project). A new team brought together doesn't normally have that sense of TEAM and so the Project Manager needs to try and help engender a "team ethic". A number of things can contribute to getting to a real team and events outside work can contribute. Sometimes the team needs to go through a Form, Storm, Norm, Perform process to get to the high performing state. On a one to one basis, I always aim to be as honest as I can in communications, calling out good things, saying when I don't believe a good job is being done. You need to appreciate that there will be different personality types in your team (and your stakeholders too!). The formal way of assessing is via psychometric testing such as Myers Briggs where each person is mapped to 16 different personality types. 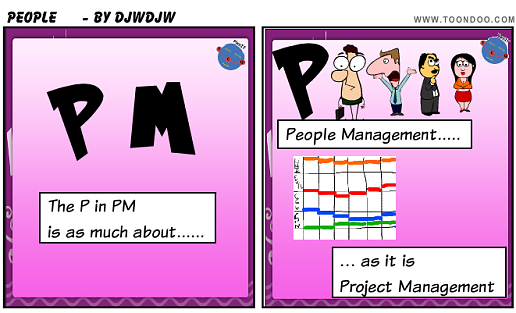 It is unlikely that this is going to be undertaken on most Project teams but as a People Manager you and other team leaders should have an awareness that people are different, the clues to their personality types and how this affects the approach to interact with them and in addition, how they are likely to respond. To take one concrete example, someone in a senior position is most likely to be a personality type such as ENTJ and will want summary information, not wallow in detail so consider this when communicating. So try and assess / understand the personality types in your team, within your Stakeholders and don't forget yourself! Then interact accordingly. My personal approach to building relationships is to be a "genuine" person. I always try and be honest with people (whether praising or criticising) , value people's input, don't be serious all the time so have a laugh and a joke, balance listening and talking etc and take some time to learn about what people are up to outside work. Don't forget in the heat of battle to say thank you and well done when appropriate! In terms of being Genuine, don't think you can "fake" these interactions because people will quickly see through that. If you aren't the type of personality to naturally interact then try and develop these skills but some argue a leopard cannot change his spots. However my belief is that you can change your personality a little over time or maybe just self-manage a little better knowing your own characteristics and how others see you. The bottom line in interactions with team-mates is to build trust with people over time so that when the pressure is on they are committed to achieving and going the extra mile as necessary. broadly I agree that money isn't a long term motivator unless it is a big incentive linked to success. Serious lack of money (well below norms for role) can be a de-motivator however! 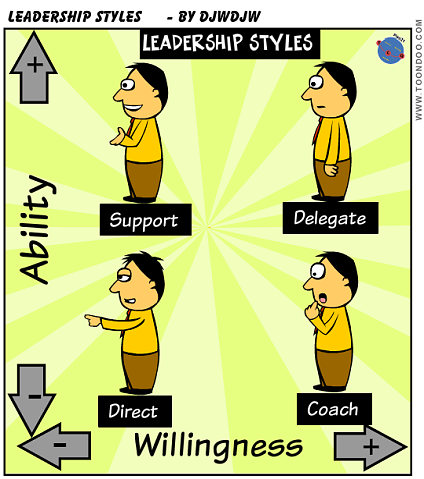 You (and your team managers) should adapt your leadership styles to apply in different situations are shown below. Support - You assess that your team member has the skills and experience but lacks the drive to get things done. There could be a number of reasons for this such as basic laziness, a personality which is easily distracted etc. You have regular short checkpoints for good monitoring & control giving praise when the person is on track and a size 9 boot when they are not! Direct - if the team member lacks skills, experience and motivation start worrying! But while you worry, you need to get the task done so this needs the most frequent monitoring & control and basically you direct to say "do this", "now do this" etc. If things improve, hopefully you can move more to a coaching style with more two way conversation as this is best for the individual and you. In the above give consideration to work package principles I went through in a previous post.